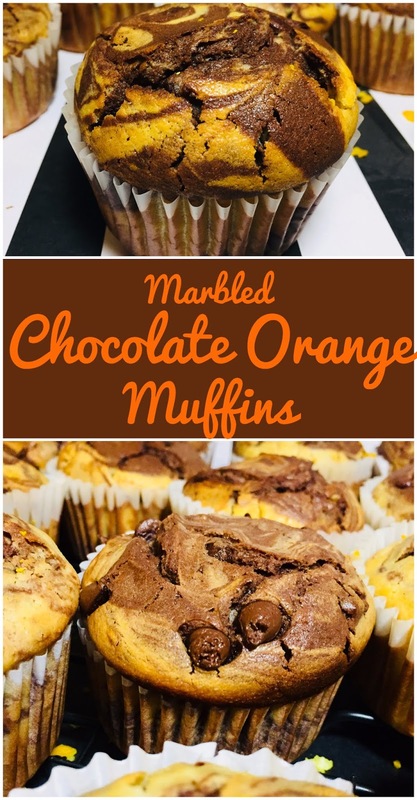 A yummy combination orange and chocolate swirled muffins, tangy orange and sweet chocolate balance each other out perfectly. School starts soon around where I live, I know its soon but that's normal because the kids get out of school in May. That's how it was for me growing up. This recipe was inspired by the fact school is starting and kids need to have a somewhat healthy breakfast or snack instead of a packaged muffin with tons of sugar and preservatives. I made a recipe similar to this, Milk Chocolate and Orange Scones, they were a totally hit with my family. Especially my niece and nephews, they ate them up and they are coming over a lot before school starts again and they need a little snack. These muffins are a really great combination of the slightly tart orange batter and a rich chocolate batter swirled together. 1. In a medium size bowl, zest oranges into 3/4 cup of sugar and let that sit for 30 minutes. 2. Orange batter: In a medium size bowl, combine flour, baking powder and salt. Set aside. In a large bowl, whisk together melted butter and sugar for 2 to 3 minutes or until its slightly fluffy and pale. Add orange juice, orange zest, vanilla extract, sour cream and eggs. Whisk just until well combined. Slowly alternate flour mixture and milk. Cover batter and chill for 30 minutes. 2. Chocolate Batter: In a medium size bowl, combine flour, baking powder and salt. Set aside. In a large bowl, whisk together melted butter, 1 cup chocolate chips, 1/4 cup cocoa powder, dark brown sugar and granulated sugar 2 to 3 minutes or until slightly fluffy and pale. Add in last 1/4 cup cocoa powder and eggs. Whisk just until well combined. Slowly alternate milk and flour. Cover batter and chill for 30 minutes. 3. Preheat oven to 350 degrees. Either spray muffin tin with nonstick cooking spray or use liners. With a 1 1/2 tablespoon cookie scoop or two spoons alternate the two batters then lightly swirl. 4. Bake in the oven for 20 to 25 minutes or until a toothpick comes clean. Let muffins cool in the pan for 10 minutes then transfer to wired rack to cool completely. 5. Store in a airtight container and will stay fresh up to a week. you are a professional ! !Scrolling down this wonderful recipe made my mouth water ,Im craving for a cupcake now... You are awesome .. I mean this just looks delicious! These look absolutely delicious!!! I'd probably devour them in a day or two, lol! I love a good muffin! These look yummy! Shut the front door, these are for real? OMG they look soo good! These look so good! I love chocolate and orange together! These look absolute amazing! Remind me of costco loaf cakes. Totally will make one day! These look so good. I haven't tried chocolate and citrus together before. Okay, these look amazing! I love anything orange flavored, and the chocolate mixed with that sounds delicious. I love the combination of orange chocolate together so this a wining combo for me. I can not wait to try out this recipe. My husband loves chocolate oranges! I'll have to make this for him. Not only would these make a great snack idea in school lunches, but I bet they'd be a hit at school bakesales!! You can control the ingredients to make sure they are nut free, and who doesn't love orange and chocolate together?!? Wow these look so yummy!! These would be perfect for a party or brunch. I would totally make these for the weekend when I'm having company over. The ingredients that you use are fabulous!! Definitely a miss try! Thanks for this detailed recipe. Seems so easy to make and perfect to pack for school. I will have to try making these the next time my nieces come over. We love baking together, and chocolate and orange is one of their favorite flavor combinations. These sound delicious and I think my kids would love them! We aren't back in school until September, but will try them out this summer I think! Delicious looking muffins. Too bad I am a horrible baker. omg these looks soooo yummy! I neeever would have thought to do this kind of combination before! BUt man this sounds so delicious! This looks really delicious! I have always loved the tangy and sweet combination of pastries. So happy to get to see your recipe. It is perfect for our Saturday baking class. Love chocolate cake. Cant wait to make some soon. This reminds me of Terry's chocolate, but just softer and I can imagine it smelling divine! That does sound early for school to start, but my university started in August and got out in May. Perfect for travel! These muffins look so yummy! These sound delicious! Love the orange and chocolate combo! I have never tried chocolate and orange together- you have me curious! Yum! I love the idea of fresh treats for kids rather then processed pre packaged junk for them! I can't believe it's almost Back to School time! These muffins are perfect for breakfast or a great afternoon treat! I'm 100% trying out this recipe this weekend! Thank you for sharing it! Omg these look so good! I love muffins for breakfast, so I'll have to give these a go! Hi! Beautiful pictures. I want to eat them. I plan to save your recipe to make it one day and replace the sugar with stevia. You mentioned this was a healthier breakfast for you family, but they look and sound like cupcakes to me!! Either way, delicious. I love making and eating muffins as well as trying out new recipes! These marbled chocolate-orange muffins look amazing. I want to reach through my screen and snag one! Chocolate and orange sound fantastic together in these muffins. Beautiful swirl too! These sound really great! I'd love to try and make them! These sounds delicious. I love the flavor combination of orange and chocolate. They compliment each other perfectly. School starts soon where I am too. And they didn't get out of school until mid-June. What the heck happened to summer? But anyway, these muffins look delicious. I love chocolate and orange together. You can't go wrong with chocolate. Now I want to bake. Wow! this marbled chocolate orange muffins looks really tempting and yummy! My kids would love this for sure. I will absolutely try this recipe for them.